Before I list you the best ways to be productive at work as well as throughout your day, there is one question that may occur in your mind, and which I would like to clarify. Why are we all so obsessive about the Productivity? Some consider success as the way to do things more precisely and with perfection. Few others consider success a comparative tool, and if they are able to do things better than others, then they consider themselves successful, despite the fact that there are lots others who can do things better than them. But there are a group of people who always do things better than others and are able to deliver more productive results. So, the reason why we all are obsessed with productivity is that the competition is intense in this digital age. Avoiding distractions and performing tasks efficiently is highly difficult, but this is what that is needed the most in this digital arena. What I conclude is that if you wish to stand above others, then you have to possess a set of numerous essential skills. 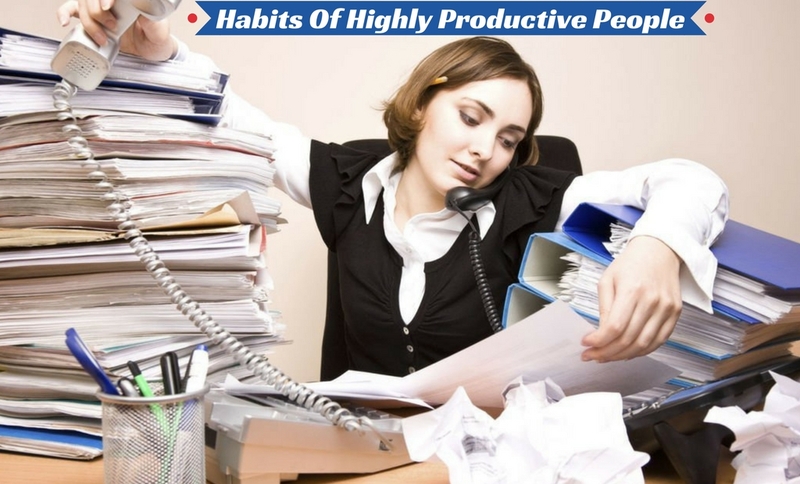 So, if you want to know what these skills or habits are that make some people more productive than others, then here I will list them for you. These are the top habits most of the productive people follow, and doing the same can help you become even more productive and efficient. Meeting requirements of your most desired project can make you feel overwhelmed. But creating a daily list of things or actions to be done can keep you motivated and help accomplish the tasks. By doing this, you can stay honest and motivated towards the work, and achieve great progressive results. Initially, you may instigate at the small scale but can gradually build over time. The best habit is to make a list of things you need to accomplish throughout the day. One common habit that most productive people do is to always try to find out free time for them. Having surplus time to get things done or to learn something new ensures that either your challenge is too small or you not planning big enough. Hence, you must take some free time and segregate it to practicing any video, edit a book, watch the film, or do any other thing that you want. Just moving ahead is not feasible to be more productive. It is important to fix all the problems. When met with a challenge or fear, you need to overcome it and ensure that it does not come back in your way. Successful people are focused more on fixing the issues and ensuring that it does not come back again in your way. So, whenever you feel down, you must jot down things that went wrong. Also, fix them and make sure that it does not come again in your way. The present world is regularly stimulated by electronic communications. From social media notifications, text messaging, to mobile emails, all these can become severe drains of time, if handled inappropriately. A way out is to limit your time to check social media and emails once in a day. Even you must decide a particular time to check and update your social networking platforms. All this will help limit the distractions. As per experts, there is no such time to do things perfectly. Even there will never be a time to do a great thing. Successful people understand this very well. Hence, instead of waiting for the perfect time to come, they believe in doing the things right away. Now is the best time to do a thing and jump into an action. No matter how inexperienced, unprepared, and uneducated you are, when things are to be done, then they must be done right away. For most of the successful people, their best thoughts occur at inappropriate times, like during exercise or before going to the night sleep, or while they are commuting. Gathering those ideas will allow you to use them later in a better way. The best way is to keep a pocket size journal in your bag or purse and whenever you get any such idea you must gather it and use it afterward. One thing that mass media highlights are about the success and fame of the productive and successful people, but no one knows the levels of hard work they have put into it. You must always consider the practice, hard work, sleepless nights, and more such aspects that successful people do in order to gain success. If you really want to be successful, then you can start with practicing small things every time. This will ensure that you are moving towards progressing your dream. If you want to be successful and more productive, then you have to focus more on your work and less on the other things. So, eliminate negative emotions, envy, and similar feelings if you really want to make bigger things work for you. Just avoid small things and free your mind to let just focus on your work. If you are surrounded by others who always identify your negatives, then stay away from them. Also, talk often but talk less to others. Even if individuals don’t return you the favor back, then still talk to them freely and promote your knowledge to them. Luck and destiny is one thing, but what you get depends mainly on your sacrifice and hard work. You must admire successful and productive film stars, CEOs, sportsmen, and other such celebrities and you must also be aware of all the hard work they have put into achieving such things. No need to overload yourself, but make sure you do enough hard work so that you can reach your desired aims and goals. Take small jumps every week and slowly you would get on the pace that you desire. Another amazing habit of productive people is that they embrace criticism. Even if nobody likes them or cheats on them, they still act defensive, dismiss immediately the negative feelings and opinions of others. If you want to be more productive then embrace criticism. Listen to what others want to say, but do what you want to do and use them to grow in your career. Most of the times we all end up saying YES to things as we don’t want others to consider us unfriendly, unhelpful, or rude. But this is one of the biggest mistakes that we make. It is essential to know the grace and tactics to settle things smoothly and without appearing rude or disgraceful. You can respond politely and say NO to individuals. There are numerous ways to do so and you can develop your own way to say no and focus on doing your own things. It is important to set time frames and deadlines if you want to measure your productivity. Productive people intend to do tasks on time and in best possible way. They take each task seriously. For this, they decide a limit for each task and then attempt to do things within their decided time frame. So, even you must develop this habit and do such things so that you are able to meet the tasks and even measure your productivity at the same time. Hence, pick a task, set the desired time limit, and stick to that limit. The foremost thing essential to be productive throughout the day is to have a proper nighttime routine. This is the most important thing to do as it sets the tone for the remaining day. Hence, you need to develop a habit of developing an appropriate nighttime routine. Make sure you do few things at night before, such as prioritizing your next day tasks, set a timeline for each task, prepare a list and make notes. The next morning you can stick to the routine and follow it in the super-fast motion to maintain your productivity. This is another excellent habit of successful people as they want to get things on time and smoothly. Develop a morning routine and make sure you don’t ask for me time during the day. You can always plan me time in the night or in the late evening. Once you have developed a routine, you can work out to follow and improve on it. One belief that productive people do is that they need to do all things themselves. While this is something that must be followed by everyone, as you must have the ability and skill to get a task done as and when needed. But if there are situations, when other things are coming in between your priorities and maintaining your productivity, then you must delegate tasks to other persons at right time and to the right person. Maybe it is doing any household work, or maintaining long-term relationships with customers, or handling the kids, or taking care of finances, be it anything. If there are tasks that you think are not too important and can be handled by others, then you must delegate the tasks to others. There have been numerous researches confirming that one who does multi-tasking may end up doing nothing and failing to do things properly. Hence, if you want to be productive, then you must avoid multi-tasking and choose one important task to be done first, followed by other things. If you are focused on completing a task, then you can do it better and more precisely. This way, you can perform different tasks easily, on time, and more productively. If you will continue working long hours then you may end up screwing your mind. So, an important habit to develop to be more productive is to take small breaks often. It is essential to give your brain enough time to feel refreshed. So, taking a small snack break, or going for a short walk, or simply meditating, or watching any funny videos, you can plan a schedule and follow it in order to maintain your productivity. If you will begin your day watching emails, messages, and doing such things, then you are offering others a chance to dictate your accomplishments. Rather, develop a habit of starting your morning at good notes and doing things that you want to do. Be it exercising, watching the news, meditating, having good breakfast, or working out, just start your day with what you want to do. You are more focused, more energetic, and more willing to do things. Hence, make sure you pick up challenging tasks in the morning. Since your brain is fresh, you will be able to do it more wisely. You can save meetings and other busy works after lunch. Schedule your day in a proper way to make most out of it. Sometimes, you may spend your time doing less important things while leaving the more real work aside. Avoid doing this mistake as this is the biggest challenge in your path of being productive. Always do important things first to gain real productivity. Staying productive is not a tough subject to learn. All you need to do is develop such habits, and you will yourself see the difference in just a few days.